Nearly one month after the landmark 2014 Lok Sabha election, India waits for newly-elected Prime Minister Narendra Modi to make good on his election promises. During his campaign, former Chief Minister Modi vowed to catalyze economic growth, curtail corruption, and defend the poor, a platform that surely helped him earn the largest margin of victory in the country’s history. Now, in the face of slowing economic growth and rising income inequality, Modi is expected to apply his development prowess for the rest of India. The answer is simple: subsidy reform. Since India’s independence from Britain, subsidies have had a major presence in India’s budget. 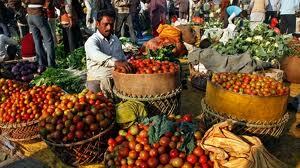 India’s 2014-2015 interim budget estimated $21.2 billion in subsidies for food and petroleum alone. 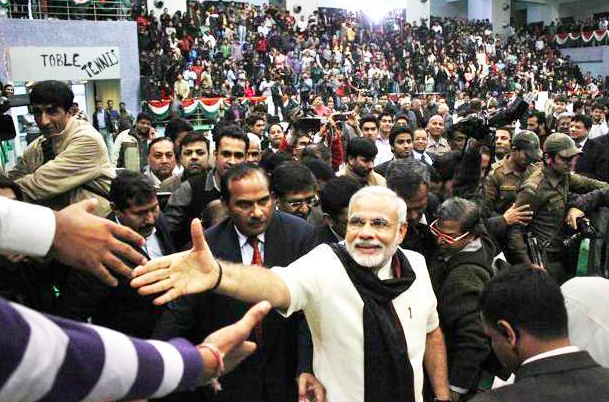 Until Modi’s election, this trend showed no sign of changing. Next month, the Modi government is set to unveil its first budget, the first likely indicator of Modi’s fulfillment of campaign promises. Recently, Mr. Modi has hinted that his economic policies and corresponding budget will be unpopular with India, most likely due in part to the diminishing role of petroleum and agriculture subsidies. India is host to a myriad of subsidies. From petroleum to education, India even subsidizes Muslim citizens to make the Haj. Of these, some of the most controversial are food subsidies. Within this broad scope, there are subsidies for fertilizer, irrigation, and electricity as well as in-kind food subsidies. The Government of India has barely reformed its food subsidy policy since the mid-1970s, with the exception of the 2013 National Food Security Act. The National Security Act provides food to two-thirds of India’s population, though only 22% live beneath the poverty line. Designed with combating poverty in mind, subsidies are expected to boost production and increase efficiency while bolstering India’s recently declining growth rates. However, in reality, the inverse is true. Indian subsidies in agriculture are distributed unequally across the states. For example, the states of Assam and Madhya Pradesh, receive disproportionate agricultural subsidies, with the former receiving 600 rupees per agricultural person and the latter receiving 40 rupees per agricultural person. Both states, with active agricultural sectors, receive unequal subsidies for their efforts, leaving Madhya Pradesh to be one of the country’s more prosperous states and Assam one of the least developed. Further, it is unlikely that in-kind food subsidies even reach India’s poorest. As early as 1985, the public distribution system was responsible for a mere 15% of the allocations meant for the poor, a track record that has worsened over time. Though it may seem that business-centric Modi has neglected the poor in lieu of increasing foreign investment and freeing the labor markets, the new Prime Minister ’s policy reforms could be a key to reducing poverty. In a recent speech to Parliament, Modi alluded to administrative changes to increase the efficiency of the state-run Food Corporation of India. These reforms could come in the form of a nation-wide cash transfer system that could increase distribution efficiency and restore foodstuffs to market prices. With demonstrated effectiveness in neighboring Indonesia, cash transfers allow more targeted assistance and more effective poverty reduction. Though it is unlikely that Modi will eradicate subsidies altogether, it is clear that he is dedicated to their reform. For better or for worse, Narendra Modi’s victory is a sign for changing times in Indian politics. The Modi government’s new budget is expected to be introduced in early July, but the transition from planning to implementation will be a challenge. Parliament must review and approve the budget, meaning that the Modi’s budget could be met with opposition before it even reaches the Rajya Sabha. Though scaling back subsidies and bolstering growth are ambitious, the greater obstacle could be a lack of political will. Twenty years after the genocide in Rwanda, things seem to be looking a bit brighter. With an average annual growth rate of eight percent since 2001 and over one million people lifted out of poverty, Rwanda is poised to continue growing by leaps and bounds. Even so, 20% of Rwanda’s economy comes from foreign aid, only trailing its exports of coffee and tea. As with most developing countries, one of the most visible signs of growth is the new buildings sprouting from the ground around the capital of Kigali. As impressive as office buildings and shopping malls are, it remains to be seen how beneficial these structures are to the economy and people of Kigali and other developing cities. The benefits of the construction industry in developing countries is clear. The global construction industry was approximately $1.7 trillion in 2007, and typically accounts for 5-7% of each country’s GDP. Jobs in the construction sector tend to be low-skill jobs, something that most developing countries, and especially Rwanda, have in abundance. A report by the International Labor Organization (ILO) found that workers in places as diverse as India, Brazil, and China were significantly more likely to be illiterate and have few years of schooling. Construction is also an investment, as there are roads, buildings, and other structures that can be used to house offices, transport goods, and improve the human and business capabilities. Kigali is already one of the most urbanized cities in Africa, and is expected to grow by 79.9% by 2025. Construction in Kigali and satellite cities is meant to ease congestion of an already dense capital of a densely-populated country. There are some issues with the construction industry in the developing world. The first one involves property rights. Large amounts of people in cities in the developing world don’t have a title or ownership to the land that they live on, especially in slums. Hernando de Soto, president of the of the Institute for Liberty and Democracy in Peru, has referred to slums as “dead capital”, alluding to the idea that people make improvements by building shantytowns but are not able to use it for collateral due to red tape. The perniciousness of not actually owning the land that one’s house is built on is even worse. In Kigali, 70% of housing is informal, with the government proposing to demolish that housing and creating more high-density areas and rent-to-own schemes. However, housing in the suburbs of Kigali currently typically costs 25,000 francs ($36.87) a month in a country where 45% of people still live below the poverty line. There’s a fear that parts of Kigali could end up like Nova Cidade de Kilamba, a suburb of Luanda that is a ghost town built and funded by the Chinese. Developing countries, and Africa in particular, have been raising questions about who benefits from the construction industry. Recent reports by investigative journalists from the Forum for African Investigative Reporters (FAIR) in Kigali have found that foreign firms, notably the Chinese, have done a substantial portion of construction. The Chinese are able to undercut local firms by using Chinese contractors backed by subsidized loans provided by the Chinese state. An operations engineer at a Chinese company working in Rwanda stated that his company could get loans with an 8% interest payment while Rwandan companies could only obtain loans with 17-18%, if they could even get a loan at all. There is a final concern about construction and corruption. Since construction contracts tend to be a fee and cost of materials, construction companies tend to be implicated more frequently. They overstate the amount of labor used on a project, pocketing the difference. One field experiment in Indonesia found that an increase in official audits of construction projects reduced missing expenditures of labor, ie nonexistent workers, by between 14 and 22%. Construction and engineering companies dominate the current World Bank list of debarred firms, the largest of which was SNC-Lavalin, a Canadian firm, which was debarred over bribery charges around the $1.2 billion funding of the Padma bridge in Bangladesh. Because of these troubling factors, questions, concerns, and confidence over construction in cities like Kigali will continue to surface. The Intergovernmental Panel on Climate Change (IPCC) recently released its newest findings on global warming, and the general conclusion is unsurprising: pollution is harming our environment in such a way that there will be dire consequences in the future. But the report had an even more interesting finding: the framing around climate change is all wrong. Climate change has become much more than an environmental issue and, as a future determinant of food security, has bled into our understanding of human rights. The framing of an issue is critical to policy formation and resource mobilization. If an issue does not have the proper framing, one that appeals to the general public, then gaining public support becomes that much more difficult. Look at issues such as gay marriage. When gay marriage was a religious issue, no progress was made on legalizing it. Only when supporters framed gay marriage as a civil rights issue did legalization begin to occur. The same theory applies to development issues. The current understanding of climate change is that it is an environmental issue that can affect the occurrence and size of natural disasters. Climate change can lead to massive blizzards, devastating typhoons, and the melting of the polar icecaps. 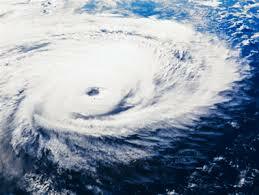 But framing climate change in a natural disaster context does not convey the urgency of the issue. With or without climate change, natural disasters are going to occur. No human intervention can stop it. As a result, the common perception is that there are no immediate benefits to addressing climate change and this understanding promotes apathy in the general public. The discussion of climate change, however, might be more productive if the development community transformed it into a food security issue that directly impacts human rights. IPCC findings show that agricultural yields could drastically decrease as soon as 2030, and just a two-degree change in temperature has the ability to kill crops and create food shortages. The IPCC report further shows that not only will there be a food shortage, but the shortage could cause a food price increase anywhere from 3% to 84%. So in addition to there being too little food, food will only be affordable for the wealthy, placing countries with high food insecurity at an elevated risk for civil unrest. Framing climate change as a food security issue adds more urgency to the problem and could help mobilize the general public to take action, regardless of their history with natural disasters. It transforms the picture of climate change from being a disaster like Typhoon Haiyan to an issue directly on people’s doorstep that could affect them at any moment. Food insecurity directly affects people at an individual level and puts every individual’s human rights at risk. It encourages the “not in my backyard” mentality that Americans in particular are very fond of. Climate change no longer just places the rights of those in developing nations at risk. Even those far removed from natural disasters can feel its effect. Some argue that the IPCC is overdramatizing the threat to food security. While this is entirely possible, it does not change the fact that a changing the framework of climate change could be key to mobilizing the public to take preventative measures. The same applies to any development issue. The development community must place increasing importance on the framing of its issues as a way to mobilize support. Some issues have already benefited from changing its frame. Female empowerment as an economic necessity is the perfect example of an issue capitalizing on a universally appealing framework. But the development community must do even more to further its other causes. Framing will tell people why they should care about international development. How can private organizations benefit from foreign investment? Why should high-income individuals care about a problem thousands of miles away? If the proper framework is not in place, then development will continue to face an uphill battle against public apathy. For the last few decades, female empowerment has become an ever increasing component of international development. Many studies have proven that conditional and unconditional cash transfers to women have had substantial impacts on human development through education and health. Under Bolsa Familia and Progresa/Oportunidades, cash transfers are given to mothers based on whether their children go to school or get preventive health care. These programs have been proven to increase school attendance. In a different realm, micro-finance institutions, such as Grameen Bank and BRAC in Bangladesh, have focused their lending to women. This is largely because women are considered to invest more wisely and repay loans more often than men. Much of the research rests on the assumption that men and women have different preferences, generally speaking. The idea is that men prefer to spend more money on consumption goods, like clothes or alcohol, while women prefer to spend money on goods that benefit the household as a whole, such as education or healthcare. Experiments have seen this played out in numerous, creative ways. Esther Duflo and Christopher Udry showed that in Cote d’Ivoire, men and women farmed different crops, with male crops being sold for profit and female crops being used for consumption by the household. Essentially, an increased production of female crops led to more food consumption and nutrition, while male crops had no effect on food consumption and nutrition. In another study in South Africa, grandmothers were more likely improve the nutrition of children, and especially young girls, compared to the grandfathers. Within this context, a new paper by Matthias Doepke and Michele Tertilt has come out with the provocative title “Does Female Empowerment Promote Economic Development”? The argument behind the article is that different spouses don’t have separate preferences but that they have different comparative advantages in the household. In the model by Doepke and Tertilt, one spouse has a higher wage while the other spouse has a lower wage. Human capital, such as education and nutrition, is considered to be a comparative advantage for the spouse with a lower wage, which tends to be the wife. A transfer from the husband to the wife tends to lead to more investment in education and nutrition, along with consumption by the wife for herself. All this is at the expense of the husband spending money on himself. At an economy-wide level, the husband is considered to have more physical capital, such as land or farming equipment, while the wife has more human capital, such as education and child rearing. The distinction between the two is that the land, farming equipment, or other physical assets are passed onto the children. Theoretically, cash transfers between spouses increases spending in general, at the expense of savings and investment that could be used on physical assets. If the economy as a whole is more service-based or dependent on education and knowledge, cash transfers would be more beneficial to economic growth in general. However, if the economy is based more on physical capital, such as farm land or industrial equipment, then transfers to the wife may be slightly detrimental as there would be less to leave to the children. No matter the economic structure, growth is affected by higher inequality between the spouses. Once there is no wage difference between the spouses, there is no effect on transfers, meaning that no matter the situation, wage parity is a desirable outcome. All cash transfers, conditional or unconditional, are not necessarily bad or should be stopped. The structural context of employment, equity, and capital affects female empowerment’s effect on economic development. Places such as Latin America, where the service sector is a more important component of the economy, are more likely to increase sustained growth through female empowerment. There are many assumptions inherent in this article, particularly since this is an economic model not based completely on empirical evidence. The overall environment is just important as the cure. The word “Morocco” conjures images of deserts, Bedouins, and souks in Marrakech, not the flamenco and Paella of Spain. Yet, there are two enclaves of Spain resting in Morocco, much to the chagrin of the Moroccans. Ceuta and Melilla are Spanish autonomous cities that lie along the Mediterranean Sea, nestled among the hills of Morocco. Both cities have been disputed by Moroccan claims, which are rejected by the Spanish government and local populations. Meanwhile, Ceuta and Melilla have become portals between Europe and Africa, both for people and goods. It has been well documented that Africans are willing to endure many hardships to cross into Europe, with news stories popping up constantly about capsizing boats off the coast of Lampadusa, Italy or the coast of Greece. Ceuta and Melilla have also become a popular destination for African migration into Europe. The Spanish authorities contend that there are around 80,000 people waiting to cross into those two Spanish cities. The sheer volume of potential immigrants has led Spain to construct a triple layer of 20 foot high fences with barbed wire around Ceuta and Melilla, manned by border police with rubber bullets. These barriers were constructed at a cost of around 30 million euros, and are referred to by some Europeans as “walls of shame”. These fences have not been a deterrent for desperate migrants looking to cross the border into Europe. There are frequent surges of people trying to cross the fences or swim to shore, hoping that their numbers will overwhelm the border guards. Earlier in February 2014, over 250 Africans tried to simultaneously climb the fences or swim into the safety of Ceuta, while the Spanish border guards fired rubber bullets in an attempt to deter them. So far, 15 bodies have been found from that altercation. The interpretation of Spanish law is largely to blame for these surges. Would-be immigrants have not officially entered Spain until they have crossed the police line, not the border. The Spanish government is looking at reforming the law to ease the pressure. Currently, the migrants are housed in the Temporary Center for Immigrants and Asylum Seekers (CETI), which is chronically overcrowded. In 2013, the Ceuta CETI housed more than 700 people in a space built for 512. Large numbers of the migrants come from countries with whom Spain does not have treaties, giving the migrants the freedom to stay in Spain once they have their paperwork. On the Moroccan side of the border, the government has been trying to “regularise” undocumented migrants to allow them to work in Morocco, while the number of deportations of migrants to the Algerian border has decreased. It’s not only people that try to cross the border clandestinely, as many Moroccan women attempt to take advantage of a loophole in Moroccan law through Ceuta and Melilla. Any goods that come into Morocco by foot are exempt from duties, as they are considered personal luggage, not goods for sale. 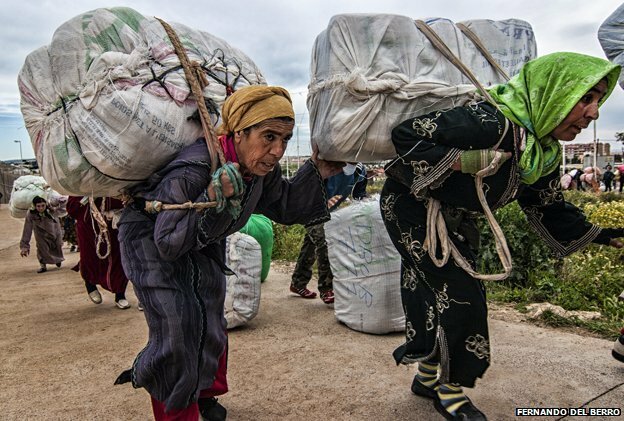 Due to this loophole, many porteadoras, mostly Moroccan women, cross the border between Ceuta and Melilla into Morocco with 60 kg (132 lbs) of goods on their backs for as little as 3 euros a trip. Most of these women make 3 to 4 trips a day carrying more than their body weight in clothes, blankets, and other goods. In 2011, this trade was estimated to be worth 15 billion dirhams, or $1.5 billion, all untaxed. Up to 90 million euros is also paid in bribes every year, mostly to Moroccan border guards, according to Moroccan weekly Al Ayam. While these may seem like difficult and hellish conditions, these jobs support 45,000 people directly and 400,000 indirectly, highlighting the importance of cross-border trade and migration. Still, there is a danger, with porters dying every so often, trampled under the crowds of people loaded with kilograms of goods. While these enclaves may seem small and unimportant, Ceuta and Melilla mean so much more to people who depend on them for their livelihood or their freedom into a new life. As much as they cause headaches for Spain, Morocco, and the European Union, there is no easy answer to resolve the issue. These European oases will continue shining like beacons, attracting the weary and desperate from the African continent.